A glorious journey highlighting a half dozen unique and memorable adventures. From Eugene follow Highway 58 (Hwy 58) along the Willamette River and through Oakridge. This road trip is approximately 140 miles (225.31 km). Enter Crater Lake National Park at the north or south entrance depending on season. From I-5 take exit 188 toward Oakridge/Klamath Falls and onto Hwy 58 (Willamette Hwy). On this 20-mile (32.19 km) pastoral section of the highway, you&apos;ll pass through the small community of Pleasant Hill, known for their innovative rubber-asphalt track, now retired, that routinely hosted the University of Oregon athletes training under Bill Bowerman in the 1970s. This was also the hometown of author Ken Kesey who wrote "One Flew Over the Cuckoo&apos;s Nest". There are a few gas stations and places to eat here. While it&apos;s possible to complete this scenic road trip in 2.5 hours, there is so much to see and do along the way that a slow pace is recommended. Hwy 58 is resplendent with rivers, creeks, lakes, hot springs and waterfalls. Right away there are parks worth an exploratory stop. 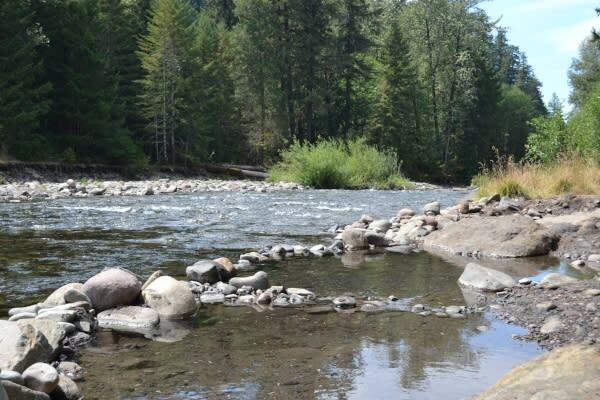 Discover Elijah Bristow State Park with hiking, mountain biking and equestrian trails along the Middle Fork of the Willamette River. Picnic facilities and restrooms make this an ideal rest area. Wide open lawns, shady woods, and bird-filled wetlands encourage joyful romps. Bring your fishing pole and fish for salmon and Steelhead trout, or launch your kayak. Continue south on Hwy 58. Next is Dexter State Recreation Site with its popular 18-hole disc golf course. The first tee is between the first two parking lots at the top of the hill. There is a boat ramp here, vault toilets, picnic tables and trails. Make sure to have your camera handy! 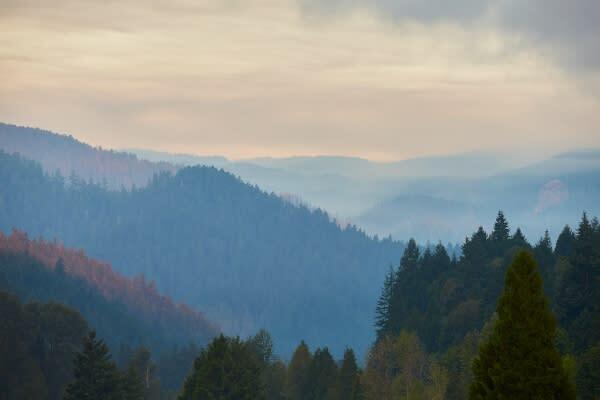 This beautiful drive becomes breathtaking as the highway skirts the length of Dexter Reservoir, followed by Lookout Point Reservoir for 15 miles (24.14 km). But first, stop in the small town of Lowell and stretch your legs at the Lowell Covered Bridge Interpretive Center on Pioneer St.
Picnic on the bridge and watch rowers or water skiers skimming across the calm lake. 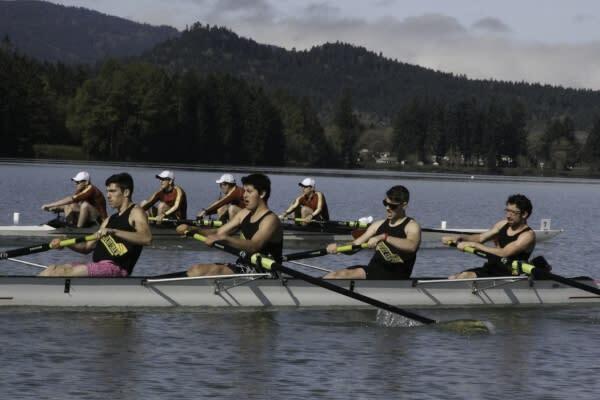 Each April the Oregon Association of Rowers hosts the Covered Bridge Regatta here. Parvin Covered Bridge is also nearby. Turn right off Hwy 58 onto Deception Creek Rd for .8 miles (1.29 km) to visit the Middle Fork Ranger Station. The ranger station is open Monday - Friday, 8 a.m. - 4:30 p.m. for current weather and road reports, restrooms, maps and visitor information. To resume your journey, return to Hwy 58. Side Trip: Interested in covered bridges? 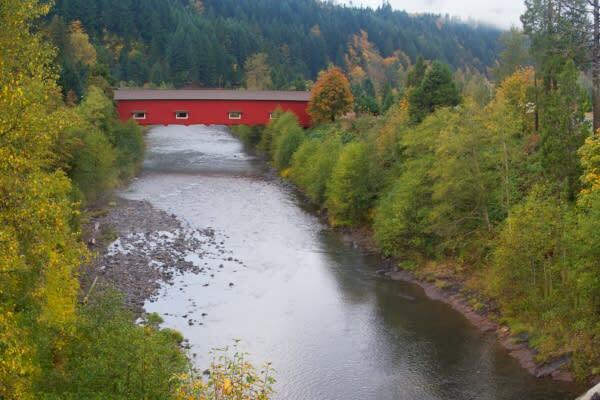 Take a two mile detour off Hwy 58 to see the Office Covered Bridge in Westfir. Built in 1944 by the Westfir Lumber Company, this picturesque red bridge is the longest covered bridge in Oregon at 180 ft (54.86 m). Designed to accommodate logging trucks, the bridge also features an adjacent pedestrian walkway for foot traffic safety. Take a left onto West Rd, then a sharp left onto N Fork Rd/Westfir Rd. Turn right onto Westfir-Oakridge Rd/Westoak Rd and right onto 1st St. Nearby, the former Westfir Lumber Company office has been transformed into the Westfir Lodge. This quirky, fun establishment serves meals Thursday - Sunday 10 a.m. - 8 p.m. Join outdoor adventurers, photographers and artists in their garden for lunch with a view of the bridge. The next stop is approximately 5 miles (8.05 km) south in the town of Oakridge. There are several lodging options here, as well as dining, gas stations, small stores and a bicycle shop. Oakridge is considered the "Mountain Biking Capital of the Northwest" and caters to an active, outdoorsy crowd. 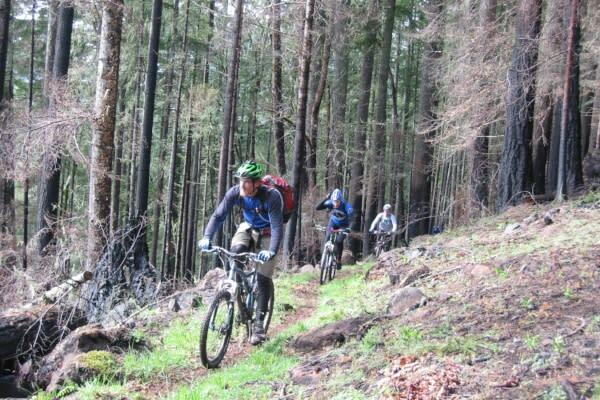 If you love mountain biking, make plans to ride some of the area&apos;s famous single track trails. Guides and bike rentals are available in town. This is also a community of naturalists and gourmets. Truffle and mushroom hunters gather here, and Oakridge is home to the Brewers Union Local 180, named in Bon Appetit&apos;s top ten nanobreweries in 2013. To visit the brewery turn left onto Hills St, then left onto Beach St and the left onto E 1st. On the way out of town, stop to explore Green Waters Park on Hwy 58 at milepost 36. Visitor information, restrooms, picnic facilities, a children&apos;s play area, amphitheater and some woodsy hiking trails make this riverfront park an excellent rest stop. 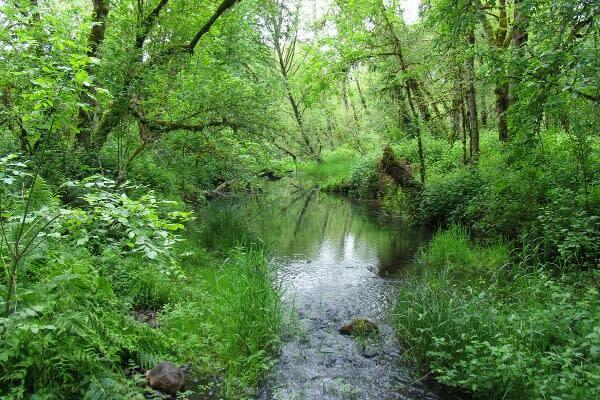 From Green Waters Park it is 4 miles (6.44 km) to the Willamette Fish Hatchery, just turn left onto Salmon Creek Rd and continue staying to the left. 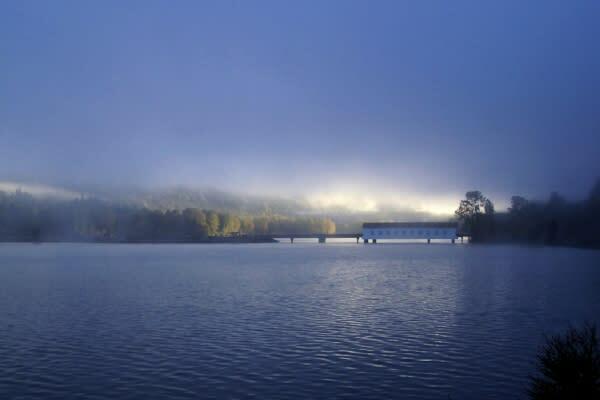 The Willamette Fish Hatchery is a project of the Oregon Department of Fish and Wildlife. Take an educational stroll around many viewing ponds filled with trout and white sturgeon. From June - September there is also salmon. Watch the fish get fed, visit the on-site museum, and play a nine-hole round of miniature golf showcasing the life cycle of salmon. Picnic and restroom facilities are available. Resume the journey on Hwy 58. Between mileposts 45 and 46 are the McCredie Hot Springs. There is a dirt parking area and a 200 yard (182.88 m) walk to the springs. There are several pools of varying diameters, the largest about 30 ft (9.14 m) across, and all are approximately 2 ft (.61 m) deep. They can be extremely hot, even when surrounded by snow drifts, so use caution before entering. Salt Creek flows fast and cold adjacent the steaming pools. Clothing is not required. There nearest campground is Blue Pool Campground operated by the U.S. Forest Service. Eleven miles (17.70 km) from McCredie Hot Springs on Hwy 58, at milepost 57, is the Salt Creek Falls Observation Site. 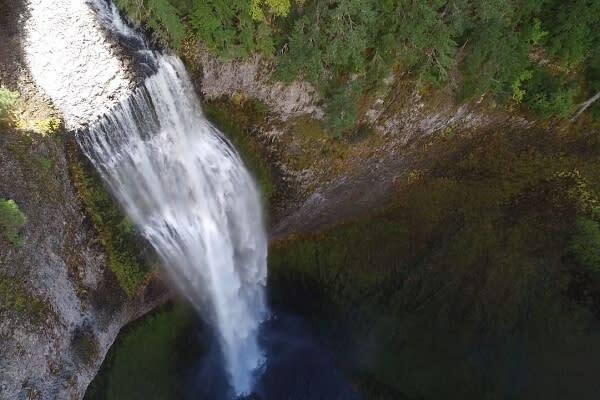 Plunging 286 ft (87.17 m), this dramatic waterfall is the second highest continuous waterfall in Oregon; Multnomah Falls being the first. Its flow typically peaks between April to August. There is a wheelchair accessible viewing platform at the top of the falls, or you can hike to the bottom. During the winter, snowshoe right up to the frosty falls for dazzling winter photos. Ten miles (16.09 km) from Salt Creek Falls, discover Waldo Lake at milepost 63. Turn left onto Forest Road 5893. The road will take you past a number of smaller lakes, and then on to another of Oregon&apos;s natural wonders. 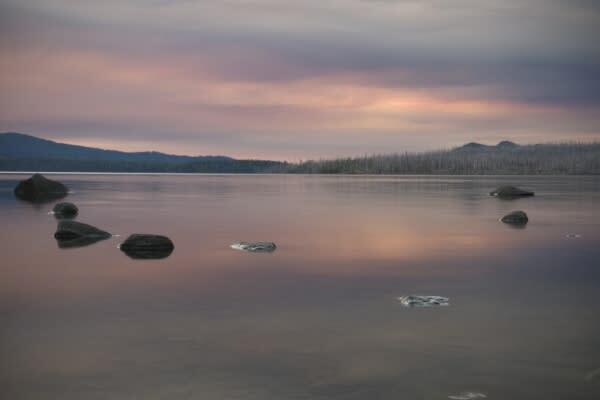 Waldo Lake&apos;s surface is 9.8 sq miles (25 km), making it the second largest lake in Oregon. And, at a maximum depth of 420 feet (130 m), Waldo Lake is one of Oregon&apos;s deepest lakes, second only to Crater Lake&apos;s staggering 1,943 feet (592 m). Filled primarily by snow melt and springs, the water fosters minimal plant growth. Originally stocked with fish, that practice has been discontinued. Waldo Lake has consistently been ranked as one of the world&apos;s purest lakes. See to depths over 100 ft (30 m) on a calm day! To preserve the lake&apos;s unique purity, only boats with electric motors are permitted at a speed limit of 10 mph (16 km/h). Gas motors, chainsaws, generators and float-planes are prohibited. There are three campgrounds on the lake. During the colder months, check out phenomenal snowmobile action at Waldo Sno-Park. Return to Hwy 58 and continue 3.2 miles (5.15 km) to the Willamette Pass Resort. With 55 acres (.22 sq km) of ski-able terrain, 12.43 miles (20 km) of Nordic trails, two terrain parks, and six lift/assists; Willamette Pass Resort is a recreational haven for winter sports. The resort offers a comfortable lodge with dining and a slope-view bar, equipment rentals, ski shop and lessons. There are 29 alpine runs accommodating beginner through advanced skiers. Enjoy tubing or snowshoeing too. Access the Pacific Crest Trail just north of the Diamond Peak Wilderness for a day hike. One mile past Willamette Pass Resort the highway once again parallels a lake shoreline. Odell Lake is popular for sailing, water skiing, wind surfing and fishing. In fact, the last two state records for lake trout were here, the most recent in 1984 for a 40 lb 8 oz and 45.5 inch long trout. Turn on to NF-5810 to Shelter Cove Resort & Marina, an all-season resort with lakefront cabins, a lodge, RV and tent sites. In the summer rent boats and go fishing. In the winter, enjoy groomed cross-country ski trails. Or continue along Hwy 58 to Hoodoo&apos;s Sunset Cove, an excellent day use area for boating or tent camping. This campground offers drinking water, vault toilets and fairly good mobile phone coverage from here. Another overnight option is The Odell Lake Lodge & Resort off NF680. From Odell Lake follow Hwy 58 southeast until it intersects with The Dalles-California Hwy, U.S. 97, approximately 20 miles (32.19 km). Turn right heading South on U.S. 97. Chemult will be your last stop for year-round gas before the park. Amtrak&apos;s Coast Starlight line stops here. This tiny town of 300 is a popular place for winter snowmobiling and dog mushing. There are a few restaurants, markets and motels here. Crater Lake National Park, Oregon Summer/north entrance: Continue southwest on U.S. 97 then turn right on OR-138 heading west. In 14 miles (22.53 km) take a left onto State Hwy 209/Crater Lake North Hwy. This road may be closed seasonally. Park access and visitor information is located here. Next, turn right onto Rim Dr and then proceed to Munson Valley Rd to reach Crater Lake Lodge. Winter/south entrance: Continue southwest on U.S. 97 for approximately 44 miles. Take exit 247 toward Crater Lake, merging onto OR 422 W and turn right on OR - 62 going west. After approximately 24 miles, turn right onto Munson Valley Rd. Park access and visitor information is located here. Continue up Munson Valley Rd to reach Crater Lake Lodge. Loop back to Eugene - Springfield via Roseburg and Cottage Grove along Interstate 5 (traveling the reverse direction).